Parents ask: "Will my child be ready for Kindergarten?" In September I got this e-mail from a parent: "Hi Teacher Boyd! 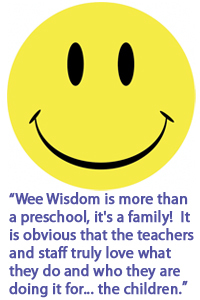 "E" is doing great in kindergarten and I believe it has so much to do with what she learned at Wee Wisdom! There are many kids in her class that struggle with listening to the teacher, listening to each other, taking turns, being gentle with each other, taking their time with their projects, etc. "E" is just so prepared for kindergarten and ready to learn." Mom enclosed the e-mail from the teacher: " Oh my goodness, I would give her 20 a day (cougar complements) if I had the time. She is a dream. Did she tell you how I showed her work as an example? She works so hard all time and follows directions. I love her. "W"